Meet some of Team EN members competing at Ironman® Coeur d’Alene 2014! 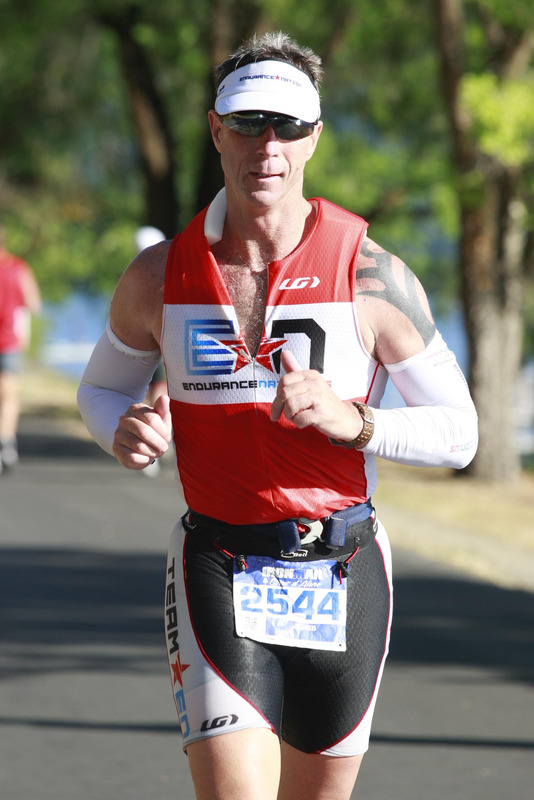 Hi, I’m Jason Brandt and Ironman® Coeur d’Alene will be my second Ironman® having done Arizona in Nov2013. I’m very excited to have the opportunity to be racing and have the loving support of my wife Kerry and kids Kyra and Jack. I’ve come a long ways with being essentially a non-swimmer 3 years ago to now having done events like the Alcatraz Sharkfest Swim, Ironman® Boise 70.3, Arizona in 10:27, Wildflower and now Coeur d’Alene. I’ll be on the course with good friend and coworker Craig Alexander and fellow Endurance Nation team member and great friend Bill Lowe. My goals for Coeur d’Alene are to execute my plan like a race ninja and turn in a good performance for the conditions. Not having done the course it is hard to state a goal but I think less than 11 hours would be awesome. I suspect the course is more difficult than Arizona so not sure that I’ll set a PR here. Thanks for reading my bio and for cheering me on virtually on race day. I have been a lurker and team member of EN for quite some time and love the team mojo always. I live in Las Vegas and have for 25 years. Married with 2 wonderful kids(the 4 legged cat type). Seriously though looking forward to better execution this year as I have always finished the Iron Man but want to be sub 12 hours is my goal. Coeur d’Alene was my first Ironman® distance triathlon in 2011, and I loved the experience. I am really happy to be going back to Idaho for my 5th Ironman. But, it is under completely different circumstances. In 2011, I was so nervous about the race and especially about the swim. I hit almost all of my workouts and showed up on race day in good shape and ready. This year, things have been really hard for me for many reasons. Work and personal life have been extra stressful, and my winter and spring training were sub-par. I was finally getting into a good routine when I had a big bike crash on Memorial Day. I cracked my helmet, had a mild concussion, totaled my bike, separated my AC shoulder joint, and some nice road rash head-to-toe. I wasn’t sure if I would be able to make the trip, but I WILL be on the beach on Sunday morning with my wetsuit on. I haven’t tried swimming yet, but am hopeful the muscle memory will carry me through. I will be on a loaner bike as my new bike isn’t ready. I don’t have any expectations for race day for myself, other than to see what I can do and enjoy the experience I am so grateful to have. I look forward to seeing you all out there and I have high-fives for everyone (with my non-injured left hand only)! Peter here. I am from the Los Angeles area and have quite the energetic/crazy household consisting of my Wife, 2 year old son, chickens, a snake, a tortoise as well as various family members who seem to take up residence in my house. This is my 2nd year as a triathlete. Coeur d’Alene will be my first Ironman® and my 3rd race with Endurance Nation. I recently raced Oceanside 70.3® in 5:14 as part of my Ironman® preparation. My training has gone well and I am excited to apply my fitness and what I have learned in EN to execute a great race. My goal is first of all to finish, but I also want to have a strong run which is my strength. I will be joined by my wife and son who are my biggest fans! Hi everyone, I’m 37 years old from The Woodlands, TX. I starting competing in triathlons 4 years ago with a local sprint tri. I was hooked immediately. I grew up swimming and love to run so it seemed like a perfect fit. I have a very supportive family with my husband and 2 boys (age 6 & 3). They have been awesome during training and will be a great motivation during the race. As this is my first Full Ironman® my goals are simple – I want to finish! I want to have fun, be safe and smart, and finish with a smile. On the other hand my boys want to know if I’m going to get first place! We may be just a little bit competitive, but finishing is just fine with me. This will me my second year in row doing Coeur d’Alene and my third IM. I will be racing with my husband Danny again and my father-in-law for his first IM. We had so much fun on this course last year we had to do it again. We have been participating in Tri since 2009 and got into the LONG stuff last year. We will be road tripping from our new home in BEND, OR excited to set some PRs from last year. Good Luck to everyone! This will be my 4th Ironman® and my second Ironman® CdA. I turn 48 on race day, what better way to celebrate a birthday than doing 140.6. I get the privilege of serving as your race captain this year and look forward to meeting all the new faces at the team dinner. I am from Amelia Island Florida. IM CDA will be my 6th IM. last 3 where Louisville 11′ & 12′ and Texas 13′. Selected CDA in hopes of having the opportunity to start a IM run in temps under 90 degrees and some vacation time afterwards exploring the pacific northwest. I will be accompanied to Coeur D A’lene by my faithful sherpa’s (Stacy and Brooks) I look forward to meeting and racing with everyone. I live in Dallas, TX with my amazingly supportive bride of 15 years and our six kiddos (ages 18 months to 11 years old). I did my first triathlon (sprint distance) in April 2013 and since then I’ve completed two 70.3® distance triathlons. Coeur d’Alene will be my first full Ironman® – something I swore I would never do. Preparing for this race has been an amazing experience – it has proved to be more difficult than I ever imagined and more rewarding than I ever thought possible. My goals for this race are to: (1) Have fun & enjoy the day (2) Take any surprises the day may offer in stride making the appropriate adjustments as needed (3) Thank as many volunteers as possible & high five at least one person per mile on the run (4) Bike the ride I “should” and not the ride I “could” (5) Finish while the sun is still in the sky. I’m from Baton Rouge. I’ve been in the sport for 2 years. This will be my third full distance IM (one DNF on the swim, one 14:22). As a family man with 2 kids, my workouts involved lots of 2 am starts with 5 hour trainer rides. I’m looking to execute on race day and run my marathon. I’m a physicist by training, control engineer by trade, gamer by night. Snowmass, CO & Gig Harbor, WA. Recently retired after 40 years as a physician. Three adult children, wife Cheryl of 35 years. 16th year in triathlon, this will be my 10th IM CDA, 26th IM (incl 3 DNS) overall. I’ve won my AG @ CDA 3x before (’06, ’09. ’10), my goal is to make this #4. I’ve been in the sport about eight years and Coeur d’Alene will be my fifth IM. IMs # 1-3 were a nice progression of Endurance Nation trained execution from a self-graded C in 2010, B in 2011 and finally B+ in 2012 with a solid (for me) marathon, 1.03 VI and an PB 11:35 finish on the Penticton course. Unfortunately 2013 brought multiple (and significant) life crisis (none self-imposed, thankfully) and although my training went relatively well I took a huge step back in my mental preparation and didn’t find the Whistler course to my liking. The ultimate result was a race day nutrition SNAFU and a slower finish then 2012. My race day goals are to execute like a ninja and let the chips fall where they may, hopefully a PB! In any event, I’m REALLY looking forward to the new venue and the EN mojo that surrounds this race. I’ve listened most of the race podcasts and I think Coach Rich’s love for the venue is rubbing off on me too.